Recently, I came across an old video cassette from the 1980s put out by a group in New Jersey known as "Catholics United For The Faith." It was an old black and white recording of the (then) Monsignor, later Bishop, Fulton J. Sheen offering Midnight Mass at St. Patrick's Cathedral in NYC. Fr. DePauw had just come out with the first and best-to-date video of himself offering the True Mass at the Ave Maria Chapel in Westbury, NY (June 1986). I'm happy to say that both my father and mother (God rest their souls) and yours truly, appear when the congregation goes up to receive Holy Communion. The video was for people who couldn't get to a True Mass, as well as those who were afraid to travel and attend the Chapel because they would be "excommunicated." Fr. DePauw had a 15 minute introduction explaining what the True Mass was and why it could not and should not be changed to a Protestant service. The Vatican II sect was outraged that the video became so popular, but were unable to find something to take people away from that "schismatic priest" and put desperately needed money in their greedy pockets. Hence, the so-called "Catholics (sic) United For The (pseudo-)Faith" resurrected the old Bp. Sheen video to compete. Remember, there was no FSSP at the time, and most priests who were ordained before Vatican II either were "rusty" with the Latin and rubrics, which wouldn't make a good video, or they were thoroughly Modernist and hated even the thought of offering the real Mass again. But no worries! They had a video of "America's Bishop" a man known for his sanctity, learning, and orthodoxy, unlike the "schismatic" and even "heretical" Fr. DePauw! The "conservative" Vatican II sect members mostly fell for it. Little did they know that Bp. Sheen himself, like the video they were using, was a Modernist ploy; trying to get people away from the Church. Fulton John Sheen (1895-1979) was a real wolf in Shepherd's clothing. Despite having a reputation as an incredible orator and preacher from his popular TV show Life Is Worth Living (1951-1957), the facts tell a different tale. Ordained a priest in 1919, and consecrated a bishop in 1951, Sheen was Auxiliary Bishop of the Archdiocese of NYC from 1951-1966 before becoming Bishop of the Diocese of Rochester, NY for the years 1966-1969. What seems like a stellar ecclesiastical vocation, was anything but that. My information on Sheen comes primarily from three (3) sources: Treasure in Clay (San Francisco: Ignatius Press, 1993)--the bishop's posthumous autobiography; America's Bishop: The Life and Times of Bishop Sheen by Thomas C. Reeve (Encounter Books, 2001), and The Fulton J. Sheen Sunday Missal (Hawthorne Books, Inc, 1961). He considered his participation in the Council one of the "great blessings" of his life. He helped Modernist Fr. John Courtney Murray in the passage of the heretical document Dignitatis Humanae (On Religious Liberty). The bishops from America were almost completely Modernists, or Modernist sympathizers. The only two major exceptions were Francis Cardinal Spellman of NYC (with whom Sheen would often fight) and Bishop Richard Henry Ackerman of Covington, Kentucky (a personal friend of Archbishop Lefebvre). The bishops from America had long smelled the polluted air of "separation of Church and State" embedded in the Masonic U.S. Constitution. Sheen was no exception. He spoke at a synagogue as Bishop of Rochester and later told Jews, "We have the same God, and we are His people." He encouraged attendance at a "revival crusade" by Protestant minister Rev. Billy Graham. How many would lose (or have doubts about) Catholicism after hearing the popular "evangelist"? He condemns Traditionalists as "schismatic" and "heretical." He counseled a woman in 1978 not to attend a Traditionalist chapel as it would lead her "...into schism and even heresy." He had this to say about the Mass: "The changes made by Pope Paul VI were not doctrinal changes, they merely changed from Latin to the vernacular. There have been many changes in the Mass down through the centuries. The Lord never said Mass in Latin; He used the language of the time. Moreover, the change in translation does not alter the meaning of the text. I am always looking for translations that make the Scriptures more understandable and clear." Could a man with an earned doctorate actually believe that? One need only look at the incredibly poor translation of the 1961 Missal bearing his name to see how he made things "more relevant" by purposeful mistranslations. In his missal, for the Words of Consecration over the Wine, Sheen translates them as: "For this is the Chalice of My Blood of the New and eternal testament: the mystery of faith: which shall be shed for you and for the multitude of mankind so that sins may be forgiven." (Emphasis mine) The preface states that the translation is the work of the editors, but I find it incredulous that Sheen couldn't make changes or edits in a work bearing his name; or didn't look it over, especially the Canon. "Pro multis" is "for many" as any first year Latin student could tell you. "For the multitude of mankind," while not strictly speaking heretical, lends itself to sound like the Novus Bogus "for ALL" which came in 1969. Sheen subscribed to universalism, and was a disciple of apostate Fr. Teilhard de Chardin. Sheen believed in the "anonymous Christian" theory of heretic Fr. Karl Rahner, stating, "Christ is hidden in all world religions, though as yet His face is veiled as it was to Moses, who asked to see it" Christ is "hidden" in Islam? Really? Although he was Director for the Society for the Propagation of the Faith, he proudly and ironically professed, "...never once was there an attempt at what might be called proselytizing" on his TV show. I guess when you have no faith, there's really nothing to propagate. Bishop Fulton J. Sheen was just another Modernist who had the veneer of orthodoxy and holiness to trap the unsuspecting. 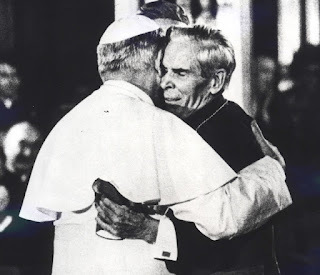 It's no surprise that John Paul the Great Apostate hugged Sheen in St. Patrick's Cathedral on October 2, 1979, calling the bishop a "loyal son of the Church (sic)." Equally no surprise is the fact that Sheen is a candidate for "sainthood." (Isn't everyone except Catholics these days?) Fulton Sheen told us "life is worth living." Unfortunately, he never understood that we are destined for eternal life with Christ, which can only be attained through His One True Church. That's what really makes this life worth anything at all. Truth. If we love Christ and His Bride...YES...we can not only 'handle it' but are saved by the same. "The bishops from America were almost completely Modernists, or Modernist sympathizers. The only two major exceptions were Francis Cardinal Spellman of NYC..."
Spellman? Didn't he support Dignitatis Humanae? Yes. However, he WENT to the Council as a strong Anti-Modernist, but came out compromised. During the Council, other prelates had convinced him that "religious liberty" was necessary to protect the Church in the U.S. from the attacks of bigots since rise in anti-Catholic rhetoric following the election of JFK. He hated John Courtney Murray, but supported "Dignitatis Humanae." In all other aspects, he fought the Modernists. According to Ralph Wiltgen in "The Tiber Flows Into The Rhine," Spellman was a reliable anti-Modernist vote and spoke out against "permanent deacons," changing Church rules on mixed marriages, and other issues. This does not excuse what he did. "The road to Hell is paved with good intentions" and this is a good case in point. After the Council, Fr. DePauw said he regretted his actions and attempted to delay "reforms" and implement the destruction as "conservatively" as possible, while Sheen rushed them in as "liberally" as possible in Rochester. Fr. DePauw told me that Spellman used his considerable political influence to get his Catholic Traditionalist Movement tax-exempt status in record time. He told Fr. he agreed with him, but didn't have the courage to stand with him. He actually broke down and cried in front of him. Another Victim of V2. Sad. I have been amazed at how many traditionals, especially sedevacantists, think that the Church was perfect before VII. Once I pointed out how bad Sheen was (if he wasn't, does anyone honestly think such a big to-do would be made of him today by the novus ordo church??) and was taken to the cleaners for saying it. Ignorance is bliss I guess. The Church in the United States was well on its way downhill long before VII. That's why it fell apart so quickly after the council. Good point as I was one of those people until 2011-2012.I was shocked (in a good way it woke me up) to read about everything that was changed and destroyed between 1951-1958.Please understand I am not condemning anyone nor do I want to argue.This is a great article,thank you for your writings. Thank you. I agree with you both. As Fr. DePauw was fond of saying, "They didn't become bums overnight!" LOL! "They didn't become bums overnight!" I would have liked Fr. DePauw! In retrospect, it was quite possobly Suprema haec sacra that accelerated indifferentism in America, among other things. PS. In reply to the idea that 'sedevacantists thought the Church was perfect. ..' the Church most certainly is in that she cannot give universal error, and in that a wolf has no authority from Christ. Impeccability, was never ascribed to the persons who held positions of authority, however. We have an entire apostate institution called 'Catholic' these days because of an idolization of someone in a cassock. Unfortunately the false idea of a sinless pope gained a lot of ground due to the radical misunderstanding of Papal Infallibility. My mother can remember being taught in the fifties that a Pope is as perfect as Christ. This false catechism seems to me to be another reason for the success of the Novus Ordo in inverted way. The one in the cassock is to be seen as Christ's authority no matter how apostate or heretical. You are correct. The theologically incorrect notion of "pope as oracle" was damaging beyond belief. Thank you for your comment. Please note that the book I cited in a comment above about the heretical mess that was V2, is called "The Rhine Flows Into The Tiber" not the other way around! My father,who refuses to leave the V2 Church,used to tell me in the 80's "The Pope is infallible,he doesn't sin,he is perfect"
I remember thinking that was impossible and it made me think Catholicism was a joke.Fast forward decades later and I attend a Catholic chapel with a valid priest who doesn't recognize any change after 1950.Simultaneously my father who was raised catholic in the 40's/50's,says I am heretical and will not leave "the Pope" no matter what happens.The infiltrators sent to the seminary and convent in the early 30's did irreparable damage to post WW2 children. Another sad story. The genius of Satan and his Modernists was in the destruction of the Faith through a completely false notion of "obedience" to an exaggerated caricature of the "pope." The obfuscation of Papal Infallibility, why Holy Mother Church defined it, and how she applies it is one the major excuses for the blind leading the blind Novus Ordo syndrome. Ironically the Novus Ordo dismiss all the real mediums of infallibility and just take a bloke in a cassock whom many hate as a wolf and 'see' Christ in Proxy, however antichrist, as an excuse for 'having' a pope existing beyond the grace definined infallibility or 'having' a pope 'infallibly' executing error universally left right and centre. How many people who have heard of 'papal infallibility' have heard of the Gallacians? the reign of Pius IX is an important reminder of Catholic reason and faith. Thank you again for another excellent article. This is an important teaching tool; too many Catholics are not fully aware of their history. As one who was born and baptized in 1968, but raised in the Novus Ordo, I can firmly say that I was wandering in the wilderness for many decades before Our Lord granted me the Grace to see the Truth. Now I assist at Mass at a CMRI Chapel in southern California. Thank you again and may Our Lord continue to Bless you and your hard work! Thank you for your most kind words. I try, by the help og God's Grace, to do whatever I can in exposing the false V2 sect, the evils of our day, and remind people of the Church's teachings. I'm humbled that God uses me as His instrument to help His work. Please pray for me, my friend, and be assured of my prayers. What is most disturbing is that according to the widow of Dietrich Von Hildebrand, when Bella Dodd converted, it was Bishop Sheen who advised her NOT to reveal the name of the 1000's of infiltrators into the seminary who had arrived at position of power in the Church. Really? That would be most interesting to read. Do you have a citation that you could send me? There are many references all over Internet to this fact, here is one of them. Dr. Von Hildebrand may still unfortunately be still part of theN.O., but she is not quite modernist at all. At this point what is keeping people like Alice in the Novus Ordo? etc... didn't have the Internet nor did they live past 2009. That Generation didn't have half the knowledge we literally own and they left the Novus Ordo decades ago! What is keeping Alice & her cohorts like Michael Voris in the anti-church at this point?